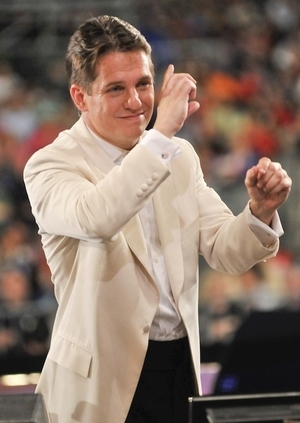 Keith Lockhart has been conductor of the Boston Pops since 1995 -- only the third maestro to hold that position since 1930. He has conducted the Pops, which opens its 125th season at Symphony Hall tonight, in more than 1,200 concerts and on dozens of tours, and has been a guest-conductor for leading orchestras worldwide. From 1998 to 2009, he was also music director of the Utah Symphony. Lockhart was interviewed recently by Globe columnist Jeff Jacoby, who prepared the following edited excerpts. Q: As the father of a newborn, where do you stand on the "put-babies-to-sleep-listening-to-Mozart" theory? A: I support early music education in all of its manifestations! But I think the whole Baby Einstein thing was proven to be unfounded. Q: You've said that you can't really listen to music for fun. Is it too much like work? A: As somebody once said to me, "I'll bet PGA golfers don't play golf on the weekends." (laughs) I've got to have some hours in my life when there's not music flowing through them. Q: As a conductor, are you still able to enjoy the great pieces that you loved 25 years ago? Or do you get jaded? A: There are pieces I have an intimate relationship with going way back to when I was first studying the classical "Top 40" -- you know, the Beethoven symphonies, the "New World" Symphony, "Pictures at an Exhibition." But the point of what I do is to look into the music and find things to communicate to the orchestra and the audience. If you're not finding new things, it's time to put the piece away for a few years. Q: Are there pieces you program not because you're dying to do them but because you feel you and the Pops should play them? A: Well, we play "Stars and Stripes Forever" probably 60 or 70 times a year, and not because we really, really, really want to get in touch with it! We play it because it's an expected part of the Pops experience, and the audience loves it. Q: What other music is in that category? A: Oh, "An American in Paris," "Rhapsody in Blue," some Bernstein pieces, "West Side Story," things like that. For me as an American conductor, and with the Pops as "America's Orchestra," I get asked to do that repertoire a lot. By the end of my life, I'm sure I'll be able to write out all the parts to "Rhapsody in Blue" and "An American in Paris" from memory. Q: Are you especially asked to perform that music overseas? A: I am often hired to do American things. I'll hear from a European orchestra, but they don't want me to do a Brahms symphony -- they want me to do Bernstein, Copland, Gershwin. Q: Why? Does being American give you particular insight into music by American composers? A: Probably less and less with every passing year, because of globalization and the shrinking world. With American music, it's a different mix, at least historically, from we grew up with, the musical milieu around us. The sounds of jazz and Broadway used to be more familiar. I'm not sure that's so true now. American orchestras have never been less homogeneous. A hundred years ago there were basically no Americans in the Boston Symphony. They were all from Europe, from German orchestras. The rehearsals were done in German. During World War I, the conductor of the Boston Symphony was actually jailed as an enemy sympathizer. A: Karl Muck. Something about him refusing to play "The Star Spangled Banner" at a concert. Q: That'll keep you playing "Stars and Stripes Forever!" A: One of the world's great orchestras and they're like, What is this? It's just not in their ear. Q: You mentioned the classical "Top 40." Is there music composed in this generation that you see rising to that level? Is there any classical music from our own era that will become genuinely beloved? A: I think there is. But remember, over the past half-century or more, the classical-music business has become much more about playing established pieces that people like -- much less about creating new experiences for them to fall in love with. When Beethoven presented a concert in 1815 in Vienna, if he did more than one piece that was not brand new, the audience would have stoned him! These days, we get stoned if we play more than one piece that's not old and familiar -- exactly the opposite. A: Witold Lutoslawski, a Polish composer. I think 50 years from now people will consider it part of the canon, but certainly you don't see audience members crowding the box office and going, "Wow, they're playing the Lutoslawski Concerto for Orchestra!" Q: Can music be great if people just don't like it -- if it doesn't touch something in the listener? A: No, I don't think music can be great if there isn't someone who can fall in love with it. Music can be well-crafted and brilliant, but if it doesn't touch anything in anybody, then it doesn't really have a reason for existence. I think the more contemporary crowd of composers gets that, and we've had a swing back toward accessibility. Q: Are there still Leroy Andersons out there composing light classical music -- the kind of thing that the Pops originally was associated with? A: Not so much. But remember, Leroy Anderson was writing popular music, not "light classical" music. That's what we've dubbed it after the fact. In the '40s, he had things like "Blue Tango" and "The Waltzing Cat" that were played on what we would consider Top 40 radio; they were commercially successful. He was writing music for the masses. Q: Why do audiences today still like to see the Boston Pops, but won't listen to orchestral music on the radio? A: I don't know. Perhaps a sociologist could explain it. A: You know, Arthur Fiedler back in the '40s, '50s, '60s, would take popular tunes of the day and have them orchestrated -- a suite from "South Pacific," for instance. Everybody knew the tunes from "South Pacific." Everybody knew "Some Enchanted Evening," because it was also a pop song. It got radio play. These days, what contemporary popular music can the Pops play that will connect in the same way? Q: So how do you square that circle? A: In terms of bringing contemporary sounds into the Pops, we work with artists who are really interested in the palette of an orchestra -- people like Josh Ritter, Ben Folds, Trey Anastasio from Phish, Amanda Palmer from Dresden Dolls. And we try to keep the standard flying high for great-sounding symphonic music -- don't sell out, don't do things that don't do honor to the orchestra or that the orchestra can't really do honor to. Q: What's something you've refused to do for just that reason? A: We've never done any hip-hop. It would sound stupid -- it would be insulting to the original as well as to the orchestra. Q: You were 35 when you came to the Pops. How does a 35-year-old conductor get a stage full of world-class musicians to follow his direction? A: There are few more intimidating positions than being a young conductor in front of an experienced orchestra. 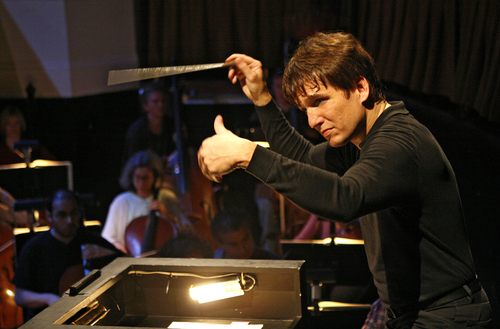 An orchestra looks to the conductor to have something significant to say musically. The conductor's job is not to play their instruments for them. The conductor's job is to coach. Think of sports: You could have Randy Moss and Tom Brady and Wes Welker and everybody else on the Patriots; without coaching you'd have nothing. In an orchestra you've got 80 people onstage and 82 different opinions. With a string quartet, all four people can discuss every phrase. You can't do that with 80 people. Q: Is conducting at 50 different from conducting at 35? A: Oh, yes. You have more experience to fall back on. Leonard Slatkin, I think, said that being a conductor is like being a good driver. You have to understand what sort of vehicle you're driving. There are orchestras that are Maseratis: they are so precise, so tight on the steering, that if you pound on them like you're driving a Mack truck you're going to end up in a ditch. On the other hand, if you drive the Mack truck the way you're driving the Maserati, it's not going to turn. He said the Boston Symphony is a Rolls Royce: very elegant, very stately. The Cleveland Orchestra is a Maserati. They are so quick and exacting in their movements. And he said some orchestras are Mack trucks. There's nothing subtle about them but they get you where you want to go. Q: You ended 11 years as music director of the Utah Symphony last year, and one of the newspapers there quoted a woman who said she would never forget the concert you conducted three days after 9/11. Can you recall what you played that night? A: Oh, very clearly. The performance was on Friday, the first concert of the season. We always started the season with the National Anthem, and I told the story of Francis Scott Key during the War of 1812, standing on a ship and not being able to see whether the port had been captured because of the smoke that filled the harbor. I think I made the analogy to the dust clouds settling at Ground Zero, to all the uncertainty we felt. We played the National Anthem in a slower, more reverential way than we normally would. And then we played "Nimrod" from the "Enigma Variations," which is absolutely gorgeous, one of my favorite pieces. We also played a big tone poem by Richard Strauss called "A Hero's Life" (Ein Heldenleben) -- and in the context of all the firefighters who died at the World Trade Center, heroism had a very special meaning for all of us that night.